This installation can be broken down into 4 groups of components: Fuel, Effects, Structure, and Electronics. While Fuel and Effects may seem to belong together in one category, they are each complex enough to deserve their own category. There is also a set of safety mechanisms that disable the entire system should one component fail or should an unsafe situation arise. Let's start with the Structure. Rock Inferno rides atop 3 pieces of 8' by 10" triangle truss, similar to what you may find stage lights suspended from in a theater. High-stress polycarbonate connectors afix the horizontal truss above the 2 vertical pieces and provide a base for the Effects and a frame for the Screen. The vertical trusses are each secured to the ground via 3 ratchet straps, hooking to either driven rebar or concrete blocks depending on the installation environment. A similar arrangement supports the projector above the player, and provides mounting locations for the spotlights aimed at the player. Color coded lights are also installed within the vertical truss on either side of the player. The Emergency Stop button is located on this truss as well. Flame effects are the show stoppers of Rock Inferno, and deserve to be noticed. So in case the 6' flames aren't enough, we housed the guts of the system inside reflective road cones. 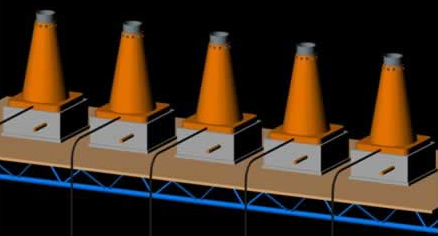 The cones double as a windbreak, which stabilizes the flame and protects the valves and fittings from any weather that may arise. A box that contains the spark generator and wiring provides a base for the cone, and in turn is mounted to the Truss. This arrangement provides a safe atmosphere by separating the fuel and electricity. Seen here are the working components, without the box or cone. The Communication wiring (Or.) enters the box and splits to the transformer and up to the valve. 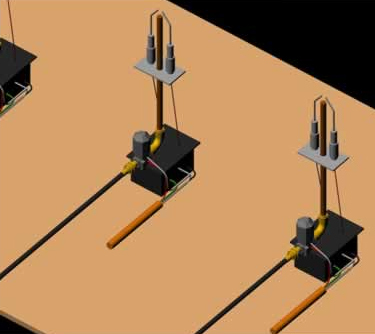 The spark lines run from the transformer to the electrodes, providing the constant ignition source. The solenoid valve controls the release of the propane and gets its signal from the incoming wires as well. The wire bundle is a re-purposed extension cord, using the Ground wire as the common Neutral. The remaining Black and White wires provide power for the solenoid and the spark, respectively. 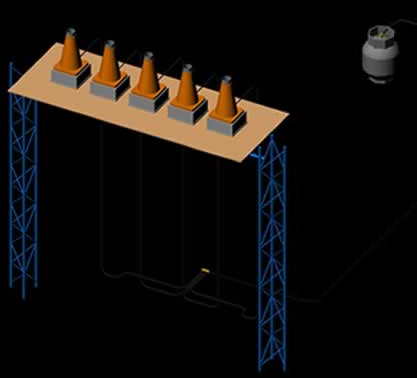 The system ground is provided by a designated cable not shown in the drawings. Our fuel train has changed a bit since this drawing and an updated drawing will be posted soon. What we started with is a POL tank connection that is installed into the 20# LP tanks that run Rock Inferno. A system pressure gauge allows us to view the pressure of the tank, and a high-flow regulator brings it down to a practical value. An attached gauge displays the output, or Line, pressure. 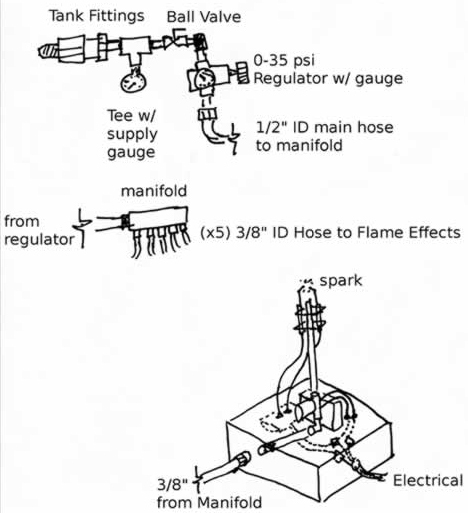 From the regulator a 1/2" LP rated hose carries the gas to a 5 port manifold that downsizes the hose size to 3/8" and splits off to the 5 accumulators feeding the Flame Effects. Our accumulators are decommissioned 20# LP tanks with a check valve and a vertical Tee, that allows the stored gas to exit into another 3/8" hose that feeds the Effects.